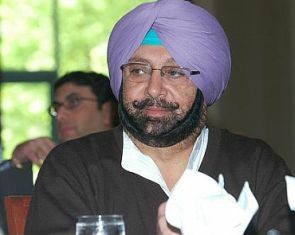 Punjab Chief Minister Amarinder Singh on Sunday declined Pakistan's invite to attend the ground-breaking ceremony for the Kartarpur Corridor on the other side of the border, even as his cabinet colleague Navjot Singh Sidhu accepted the request with 'with unalloyed joy'. In a letter to Pakistan Foreign Minister Shah Mehmood Qureshi, Singh said it is a historic occasion, but regretted his inability to be present, citing terror attacks in his state and killings of Indian soldiers by Pakistan troops as the reason. 'Firstly, not a day passes when Indian soldiers are not killed or wounded on the Line of Control in Jammu and Kashmir. Rather than moving towards normalcy, these incidents are escalating,' he said. Secondly, the chief minister claimed, Pakistan's Inter-Services Intelligence has started its nefarious activities in Punjab. 'Since March 2017, the state has neutralised 19 ISI-armed and controlled modules, apprehended 81 terrorists and seized 79 weapons, numerous grenades of the HG-84 type made in Pakistan's Ordnance factories with Austrian know how, and some IEDs,' the chief minister claimed. The last attack took place in Amritsar few days ago, on a peaceful religious congregation in a village. Three men were killed and 19, including women and children, were wounded, Singh said, adding that the terrorists had been caught. 'I hope that the (Pakistan) prime minister will understand the circumstances... It will not be possible for me to be present in Pakistan on this historic occasion, despite the fact that paying my respects at Gurdwara Sri Kartarpur Sahib has always been my cherished dream which will hopefully be fulfilled once these hostilities and killings are stopped,' he said. Thanking Qureshi for the invitation, Singh recalled his visit to Pakistan as Punjab chief minister in the past. 'As you will see from the stone laid at the Gurdwara Sri Kartarpur Sahib, it was my grandfather Maharaja Bhupindra Singh who carried out flood protection measures from 1920 to 1929 to protect our Gurdwara which was being ravaged by floods in river Ravi each year,' Singh wrote in the letter. Singh expressed hope that the Pakistan prime minister 'will do all he can to bring the two countries together on the road to peace and friendship'. However, state cabinet minister Sidhu, who had been advocating a corridor connecting Gurdwara Darbar Sahib in Pakistan's Kartarpur with Dera Baba Nanak Sahib in Punjab's Gurdaspur, on Sunday wrote to Qureshi, accepting his invitation for the ground-breaking ceremony, where Pakistan Prime Minister Imran Khan will also be present. 'It is with great honour and unalloyed joy that I accept your invitation to attend the ground-breaking ceremony at Kartarpur Sahib on November 28. I look forward to meeting you on this historic occasion,' Sidhu wrote to Qureshi. The Local Government, Tourism and Cultural Affairs Minister wrote that his application 'for permission to attend (the ceremony) is now lodged with the Ministry of External Affairs'. In the letter, Sidhu said that this day 'will indeed break ground'. 'As our nations take this first step, the Kartarpur Spirit can make pilgrims of us all, venturing out on a journey that breaks the barriers of history and opens the borders of hearts and the mind,' he said. 'A journey that our people can walk together towards, a future of shared peace and prosperity for India and Pakistan'. Sidhu had claimed then that Gen Bajwa had told him about 'making efforts to open the Kartarpur corridor'. The foundation stone for the Dera Baba Nanak-Kartarpur Sahib Corridor on the Indian side will be laid by Vice President Venkaiah Naidu and Chief Minister Amarinder Singh on November 26. The Union cabinet had on Thursday cleared a proposal for building and developing the Kartarpur corridor to provide easy passage to Sikh pilgrims to the historic Gurdwara in Pakistan.